Nassau is your first stop on your 3, 4, or 5 day Disney cruise. This is the capital city of the Bahamas and is located on New Providence Island which neighbors Paradise Island. There are beautiful beaches where you can relax and soak up the sun. If you have a more adventurous vacation style, you can parasail, waterski or rent watercraft. The British influence is strong. You'll note that drivers are on the left side of the road. There's a changing of the guard ceremony at the Government House reminiscent of Buckingham Palace. Nassau is rich in history with charming homes, churches and imposing fortresses to tour. It's easy to get around the harbor area. The city center is within walking distance with plenty of shops to explore. If you want to visit outlying areas and Paradise Island, there's no shortage of taxi services waiting at the dock. 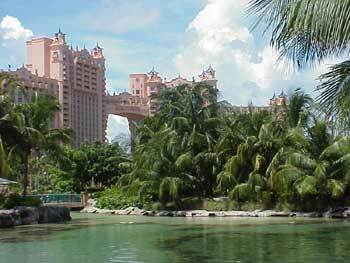 The Atlantis Resort (pictured above) is one of the more popular destinations but they do restrict access to their facilities to guests of the resorts. Your best bet is to book an Atlantis excursion with the features you're looking for. When the ships arrive, the harbor area is bustling. Ladies will get plenty of offers to braid their hair and you'll find a fleet of taxis eager to take you to where you want to go. The nearby Straw Market is a famous landmark. Here you'll find row after row of booths with merchandise for sale. It's expected that you bargain for the best deal. If that's not your style, there's a small shopping/welcome center right at the dock with a nice selection of native crafts. You can browse around without being approached by anyone. The best part about Nassau is that it's not overly large. You can accomplish a lot in the time that the ship is docked here.There is a wide array of shore excursions available that will help you to maximize your time. Explore Nassau, Cable Beach and the JFK Memorial as you explore the island in a Jeep Wrangler. Feel the wind in your hair as you see the unforgettable highlights of Nassau. Relax with flamingos and macaws in these vibrant gardens before touring the largest city in the Bahamas. Take a bus to the paradise of Ardasta Gardens, where you'll see many exotic species and take tour of Nassau. Enjoy 18 holes of beachside golf on the full-sized course at Atlantis Paradise Island. Your adventure includes tee time at a masterfully designed course without worrying about green fees, clubs or shoe rentals. Enjoy the water slides, wave pools, aquariums, beaches and many other attractions of Atlantis Paradise Island. Visit the underground aquarium of The Dig, head to the water park thrills of Aquaventure or just enjoy Atlantis' beach. Discover the amazing adventure that awaits you. Get ready to frolic with dolphins and explore fantastic Atlantis. Prepare yourself for an aquatic adventure. Explore amazing Atlantis Paradise Island and discover the adventure that awaits you. Atlantis awaits you in this awesome adventure. Swim with the dolphins and enjoy the mystical island of Atlantis. Check out the exotic marine life of Atlantis' aquarium complex and relax in the soft sands and cerulean tropical waters. Experience Atlantis' aquarium and many marine habitats before enjoying the beach and the waters of the Caribbean. Swim with these friendly mammals in a tropical lagoon and enjoy thrills at the premier water park in the Bahamas. Suit up and swim with dolphins in this unique, up-close encounter and have fun at the Aquaventure water park. High-five some flippers, getting friendly with dolphins, take on water slides and wave pools at Aquaventure. Get up-close and hands-on with dolphins before enjoying thrilling waterslides and calming wave pools at a water park. Engage with friendly dolphins in the warm waters of Atlantis and discover this marine park's other animal attractions. Travel to the Atlantis Resort and get a hands-on experience with dolphins before exploring the rest of the park. Get up-close with spectacular marine life on a guided snorkel tour-then have a blast at the Aquaventure theme park. Get ready for an exciting snorkeling experience-then have hours of fun at Aquaventure water park. Bring your A game to the Baha Mar Royal Blue Golf Club as you play a Jack Nicklaus Signature Course. Rent a kayak, snorkeling equipment or a cabana-or enjoy some sand-free recreation at the property’s 2 freshwater pools. Sail to beautiful Balmoral Island, where you can relax, soak up the sun or swim in the ocean-lunch included. Unwind in the warm waters of the Caribbean Sea or enjoy the soft white sands and crystal waters of the Blue Lagoon. Travel to the Blue Lagoon Island where you can enjoy the beach, swim or float in a kayak. Make friends with these majestic mammals when you meet trained dolphins on this once in a lifetime experience. Get up-close with dolphins in waist deep water as enjoy the chance to hug, kiss and play with these beautiful animals. Live the dream of swimming with dolphins as you handshake, hug and play with these friendly majestic mammals. Meet the dolphins of Blue Lagoon Island and play with them before being pushed through the water bottlenose-to-foot. Fall in love with the adorable ocean mammals on a close-up interaction with friendly, trained sea lions. Travel to the Blue Lagoon, where you'll be able to hug and kiss a sea lion in waist-deep water. Lounge on a pristine beach with a welcome mimosa and the comforts of an attentive butler. Take a relaxing trip to a private island for a scenic Segway ride. Land at Blue Lagoon for a memorable Segway adventure that ends with a beach activity of your choice. Discover the wonders of Nassau on a guided tour of the island. Explore western Nassau, the Nassau Caves and grab lunch at the Blue Sail Restaurant Beach Club. View the vibrant marine life and colorful coral of the Caribbean in open water as you float in crystal waters. Sail out to a fertile coral reef in the open ocean on a boat specially equipped to facilitate snorkelers. Ease across the cerulean waters of the Caribbean to colorful, vivacious coral reefs, teeming with tropical marine life. Sail out of Nassau to the 1 of 2 coral reefs where you'll immerse yourself in a vibrant, underwater ecosystem. Venture off the coast of the Bahamas to explore coral reefs, shipwrecks and more. Plunge into crystal-clear waters for up-close encounters with amazing tropical marine life. Withdraw to a world of exotic marine life, casino gaming, world-class shopping and lush landscaped grounds. Observe marine wildlife in the aquarium along with many other attractions at Atlantis Paradise Island. Cruise the crystal waters of Paradise Island Harbor and explore Nassau’s historic sites on land. Experience the best of Nassau on this historical tour by land and sea, where you’ll discover Nassau’s colonial and pirate past. Discover picturesque scenic areas of Nassau not widely known to visitors, along with unique caves and a visit to vibrant downtown. Drive from one discovery to the next in pure paradise. Cast your line out in tropical waters with the help of an experienced captain and crew. Cast off in search of the perfect catch. Fall in love with cocoa as you tour Graycliff's chocolate making factory and make your own chocolate treats. Learn what goes on behind the scenes of a chocolate factory and create a few chocolates as delicious souvenirs. Unwind poolside in the shade on the enchanting grounds of the Graycliff Hotel as you enjoy this sumptuous spot. Relax at the Graycliff Hotel's two pools and enjoy a 3-course meal and tour of these historic grounds. Revel in the unsurpassed luxury of the Graycliff Hotel as you enjoy a decadent, 4-course lunch with fine wines. Tour the exquisite Graycliff Hotel's wine cellar before eating a gourmet lunch with wines chosen to complement the meal. Soak up some sun while exploring the city of Nassau on this adventure. Discover the wonders of Nassau and Cable Beach before enjoying traditional Bahamian fare and rum. See Nassau your way—with just your small group and a personal driver. Enjoy a personalized tour of the island with a friendly local driver/guide, following your itinerary at your own pace. Experience the rich history and lively Junkanoo traditions of the Bahamas. Enjoy a scenic and eye-opening tour where you’ll discover the Bahamas’ past and its lively annual festival—Junkanoo. Enjoy poolside luxury and privacy as you take a break from your Aquaventure experience. Your personal cabana includes a list of cozy amenities to help keep things cool and soothe you. Tour this idyllic destination as only few have. Take off on a private SUV excursion to discover Nassau. Relax and unwind on your own private yacht before visiting the quaint and beautiful Harbour Island. Fall in love with Nassau as you sail to Harbour Island on a luxury yacht. Soak up the sun on Rose Island, swim with sea turtles at Green Cay or grab a photo of the world-famous Gilligan's Island — all while traveling on a private yacht. View coral reefs teeming with amazing tropical fish from an undersea observatory. Get up close with some incredible marine life aboard this one-of-a-kind vessel. Tour Nassau's best islands as you stop at Gilligan's Island, Green Cay, and Rose Island or Athol Island Reef. Snorkel, relax and take photos of some of Nassau's coolest islands in this tropical adventure. Chart a course to the turquoise waters of the Nassau Sea Gardens to explore the wondrous world below the sea. Relax and enjoy amazing views beneath the waves from the comfort of a glass-bottom boat. Swim with dolphins, snorkel with stingrays and feed sharks, going behind the scenes at Atlantis Paradise Island. Sample a day in the life of an animal trainer, including memorable close-up interactions with several marine species. Bask in the natural beauty of Nassau as you sunbathe, snorkel and sail along its coast.